Kate Moss was seen having a photo shoot at Place de la Concorde in Paris on Monday March 16. What could this be for? She was seen almost exclusively attending Karl Lagerfeld related events at Paris Fashion Week. I’m just going to say it: I was not a big fan of the Commes des Garçons H&M collection. So when I saw the first photos of the Matthew Williamson for H&M collection I was very pleased indeed. 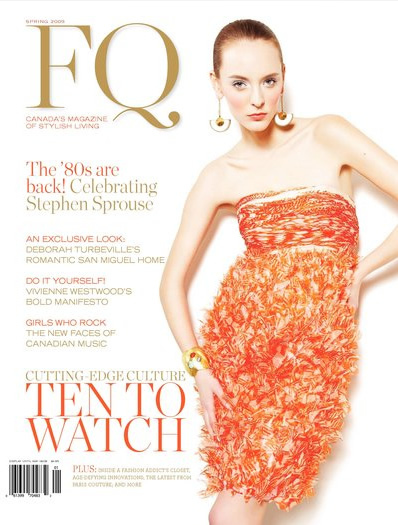 Fellow Canadians, please rush out immediately and pick up your copy of FQ Spring 2009. New Zealand born illustrator James Dignan has been commissioned to create these advertisements for a Louis Vuitton Spring Summer 2009 campaign. The ever glamorous Carine Roitfeld, editor-in-cheif of French Vogue, has been featured on CNN Revealed.